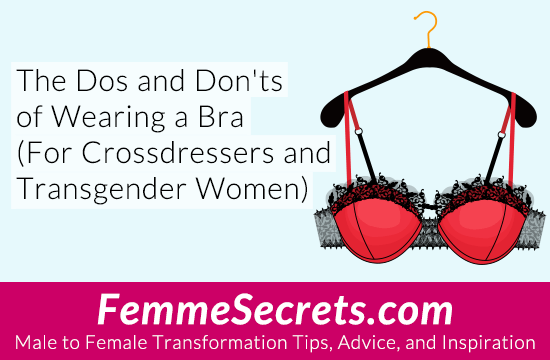 Many cis women say that they do not wear a bra to go to bed. I have heard of young cis girls having to wear a training bra even when going to sleep. I so far have gone to sleep routinely without wearing a bra. Billy…I love men who likes to wear “HIS BRA” !!! good advice as always. i love my bras, there is nothing that makes me feel feminine like choosing a beautiful color and style and putting it on in the morning – even if i have to dress as a guy during the day! my favorite type by far is an underwire design, and a demi style if i can get one. my breasts aren’t that large and the underwire keeps me from slipping out of the cup during most everyday movements. and the demi style is just because i looks pretty. most often i buy unpadded bras, and then if i am dressing up, i’ll use some silicone breast forms. works well and lets me wear a bra regardless if i have to be a guy, or get to be a girl! Chantelle is my favorite designer, all their creations seem to fit me perfectly. the exceptions to wearing an underwire bra are sports bras for exercise, and for bedtime wear i like a soft leisure bra like what Rhonda Shear makes. I have many bras – front close, back close, sport bras. But my favorites are my lace bralettes I lounge around in in the evening. What you say about not putting them in the dryer … definitely true! I ruined two of my favorite bralettes when I wasn’t thinking and I did that. 🙁 I remember now! Usually a bra for the mood I am in. special bra for nights on the town. “Michael”…I also have my “Special Bras” when I want to show off “My 46B/46C-Cup Breasts”…Bra wearing is so great. Yes it Is !!! Love my bras !!! Usually a bra for the mood I am in and a special bra for a night out . You all look really hot no matter what you wear hot clothes is just the icing on the cake yummy!